NETWORK UPDATE: SUNDAY NIGHT FOOTBALL adjusted up to 8.2 in final numbers, considerably better than last week’s 6.9. Elsewhere, 60 MINUTES, MADAM SECRETARY and THE GOOD WIFE each received a 0.1 bump (and an episode of CSI: CYBER that didn’t start until 10:59PM in most of the country was at 0.7). On FOX, the new episode of THE SIMPSONS rose 0.1, but THE LAST MAN ON EARTH lost the same. CABLE HIGHLIGHTS: AMC’s THE WALKING DEAD was–shocker–the top show on Sunday cable, although it fell 1.26 from last week’s season premiere to 6.17. 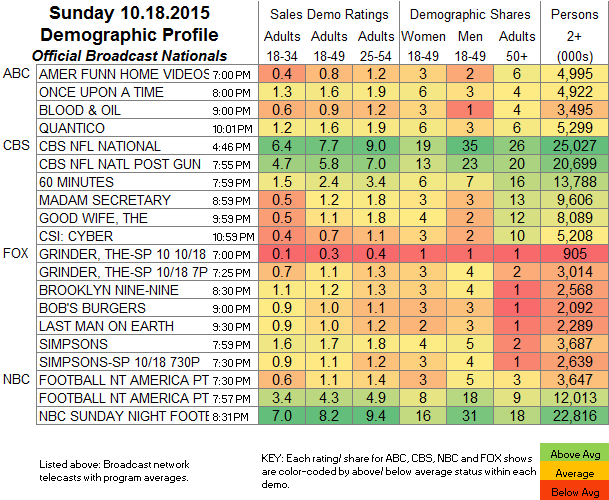 TALKING DEAD followed suit, down 0.82 to 2.08, and COMIC BOOK MEN returned at 0.47. TBS’s National League MLB PLAYOFFS game was at 1.92. Disney aired another GIRL MEETS WORLD episode at 0.69, serving as lead-in to LIV & MADDIE’s 0.48. Adult Swim’s ROBOT CHICKEN returned at 0.59. On Food Network, HALLOWEEN WARS ticked up to 0.51, and GUY’S GROCERY GAMES gained 0.09 to 0.50, with CUTTHROAT KITCHEN up a tick to 0.43. 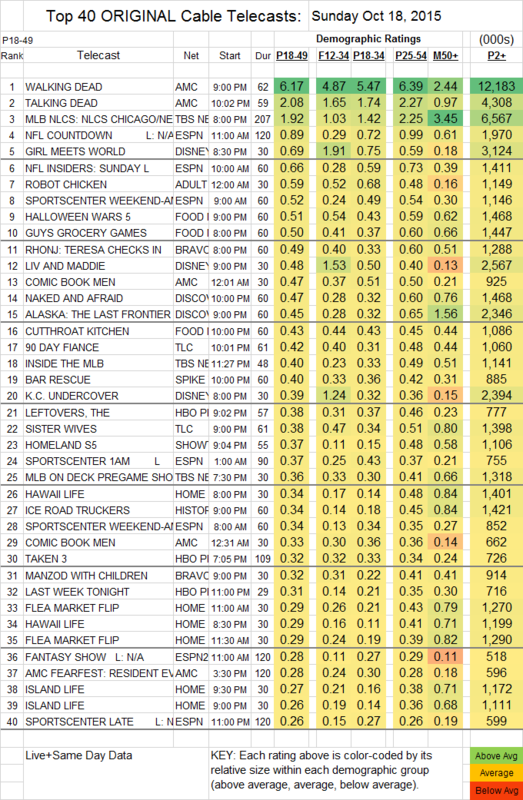 Bravo’s REAL HOUSEWIVES spin-off TERESA CHECKS IN was steady at 0.49, and MANZOD WITH CIHLDREN held at 0.32. On Discovery, NAKED & AFRAID dropped 0.06 to 0.47, and ALASKA: THE FINAL FRONTIER fell a heavier 0.17 to 0.45. History’s ICE ROAD TRUCKERS rose 0.06 to 0.34. On E!, DASH DOLLS gained 0.02 to 0.22, but HOUSE OF DVF fell 0.04 to 0.11. This week it was HBO with the upper hand at 9PM over Showtime, as THE LEFTOVERS rose 0.13 to 0.38, followed by PROJECT GREENLIGHT up 0.01 to 0.08 (212K total viewers), the season finale of DOLL & EM steady at 0.03 (75K viewers), and LAST WEEK TONIGHT up 0.07 to 0.31. HOMELAND, meanwhile, fell 0.09 to 0.37, although THE AFFAIR grew by 0.03 to 0.18.